Posted February 11, 2015 by William Martin & filed under Trailers. The first trailer has been released for ITV’s new adaptation of Julian Barnes’s novel, Arthur & George. 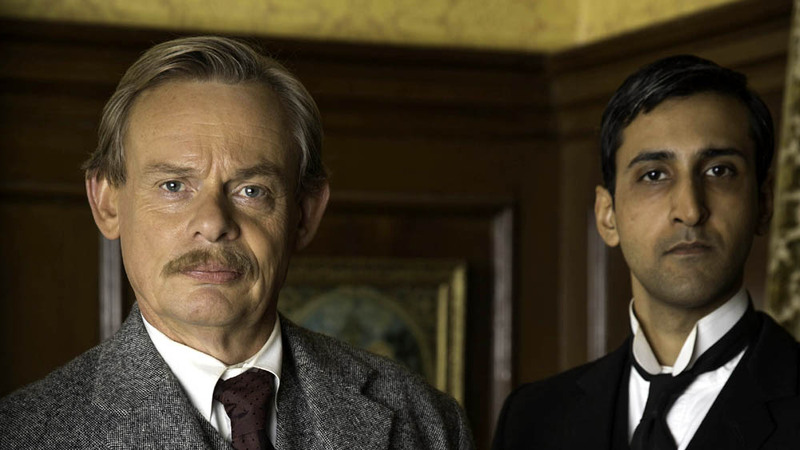 Based on an intriguing series of genuine events in the life of Sir Arthur Conan Doyle, the three part drama stars Martin Clunes (Doc Martin) as the novelist and physician who created the detective Sherlock Holmes. > Buy Arthur and George on DVD on Amazon. Written by Ed Whitmore (Silent Witness, Waking The Dead), Arthur & George will begin on ITV in March. The official synopsis reads: “Conan Doyle recaptures his zest for life by pursuing and challenging a notorious miscarriage of justice. It is the case of George Edalji, a hard-working solicitor and the son of Hampshire vicar, Reverend Shapurji Edalji and his wife Charlotte. George has served seven years in Pentonville Prison for allegedly mutilating animals and sending threatening letters, a series of offences which have become known as The Great Wyrley Rippings. The cast also include Arsher Ali (The Missing) as George Edalji, Art Malik (Holby City) as his father, the Reverend Shapurji Edalji, Emma Fielding (Silk) as his mother Charlotte Edalji, Charles Edwards (Downton Abbey) as Woodie Wood, Hattie Morahan (The Bletchley Circle) as Jean Leckie and Sandra Voe (Vera Drake) as Mam.